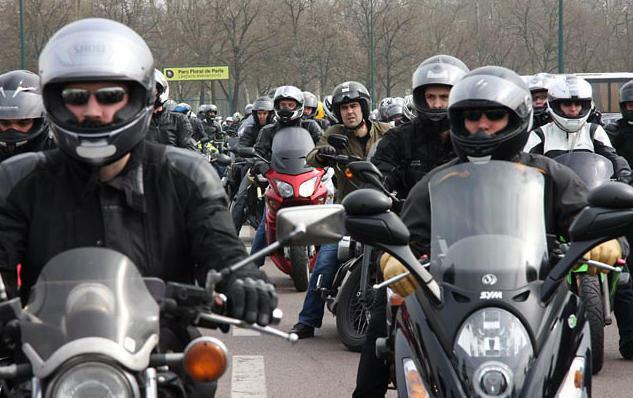 In response to the latest dirty tricks played by the French Police to catch bikers filtering through traffic (or splitting lanes) and issue them with a 90 euros fine payable on the spot together with 3 points taken off their licence, the Fédération Française des Motards en Colère (FFMC – French Federation of Angry Bikers) called all Paris based motorbike and scooter riders to go down the streets on Saturday 26 March 2011 and express their disgust at their Government’s continued refusal to make traffic filtering legal in France. Unlike previous demonstrations organised by the FFMC, the aim of this one was not to cause massive delays and complete chaos on the roads but rather gain support from other road users, including car, lorry, bus, coach and taxi drivers. Protestors aimed at making drivers realise that if the authorities continue to ban motorcyclists from riding in between lanes in heavy or slow traffic conditions, not only will they increase congestion as a result of poor road space management but they will also increase pollution in stationary traffic. While being stuck in queues of four wheel vehicles, bikers are directly exposed to harmful emissions which have the effect of damaging their langs and potentially developing respiratory complications in the long run. The angry bikers also demonstrated to their road counterparts that in case of emergency or unexpected brake, there is a high risk of them being squashed in between two cars, which could have disastreous consequences. Let’s hand out leaflets to all cagers ! 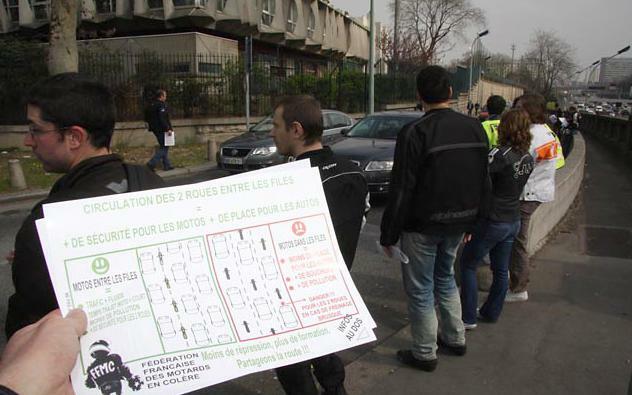 After a short briefing at Château de Vincennes in East Paris, protestors were split into groups and given thousands of leaflets to distribute to all car, bus, taxi, lorry and coach drivers all over the ring road (peripherique), which is the Police most favourite site to catch bikers filtering through traffic and issue them with fines and take points off their driving licence. The leaflets were designed to explain to all cagers the dramatic consequences that banning traffic filtering has on all road users, particularly the bikers. The aim of this was to gain as much support as possible from drivers to put pressure on the Government to make traffic filtering legal in France. 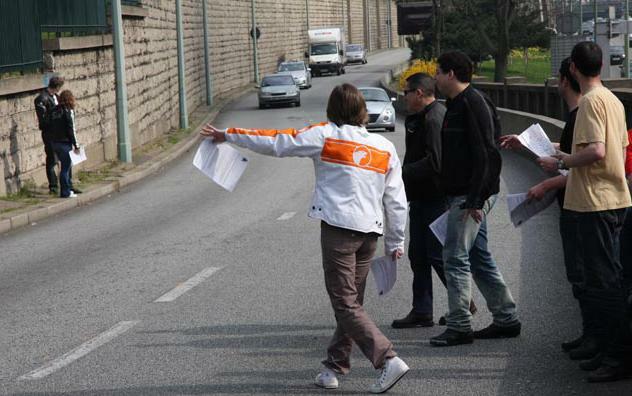 Each group of bikers was assigned an entry point to the ring road and were distributing the leaflets to all drivers, one by one, as they entered the peripherique. « Motorcycles may be banned from cities in France !